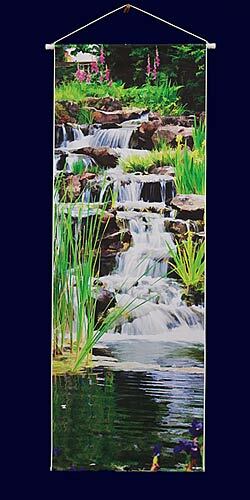 A Banner is lightweight and easy to hang indoors or outdoors. Our Banners ship well (and therefore far) and cost less to ship than any other treatment ... AND they make beautiful gifts! Each finished Banner is made of LexJet Water-Resistant Satin Clothwhich has long lasting durability. Satin Cloth Banners last outdoors all summer (even in the rain) and are very VERY long lasting indoors. 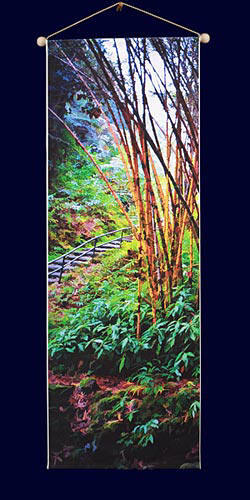 Bamboo in the Tropical Botannical Garden, Hawaii 18" X 51"
Hughes Water Garden in the Oregon Gardens, Silverton 18" X 51"
Each of these 4 panels printed as a Satin Cloth Banner and hung with fine drapery hardware will cover an entire 12 foot room! !